The Summer of No Pants Pinterest Contest Winners! Hello, again, WeAllSew readers! I’m Marigold from Hideous! Dreadful! Stinky!, and I’m back to tell you about the winners of The Summer of No Pants Pinterest Contest. In case you missed it, The Summer of No Pants is an annual skirt and dress sewing challenge. Along with my readers, I sew four skirts and/or dresses in the four weeks leading up to the first day of summer. Then, all summer long, we swear off two-legged apparel and wear only skirts and dresses until the first day of autumn. This year, Bernina and WeAllSew were kind enough to sponsor a Pinterest contest where entrants had the opportunity to win a Bernina bernette 46 sewing machine! The Judges’ Choice winner was chosen by an expert panel of judges, and a People’s Choice winner was chosen by popular vote. If you missed the challenge, don’t fret! Many of us just couldn’t stop once the contest was over, and we continue to share our creations in the SONP Google + Community, on our blogs, and across social media with the hashtag #SONP2013. Join us! We’d love to welcome you to the SONP community! The winner of the Judges’ Choice award and the Bernina bernette 46 is Laura Conner! Laura came out of nowhere for the win! She found out about SONP about an hour before submissions ended and frantically tried to get in touch with me to join the SONP G+ Community. Meanwhile, I was off reading bedtime stories to my kids and not paying attention to the computer. She managed to squeeze this entry in 24 seconds before submissions closed. I kid you not – 24 seconds left and the girl wins a Bernina! 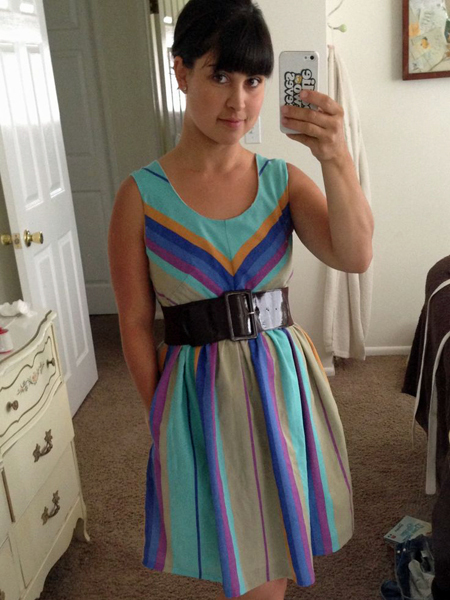 Our judges loved her beautiful take on the Angie pattern by Scientific Seamstress. The fit, construction and a modern colorway left us all swooning. Every one of the judges felt like she would wear this dress all summer long! Congratulations to Crystal of Ginger Dimples! Her second SONP dress was the most re-pinned project on the official SONP Pinterest Board and is the winner of the People’s Choice award. This dress also made it to the Final Four in the Judges’ Choice category. Crystal will be receiving a prize pack from Bernina, a free Craftsy class of her choice, and the brand new Hawthorn dress pattern from Colette Patterns! Does this dress look familiar? It should because you just saw it, like, a second ago! It’s another Angie dress! 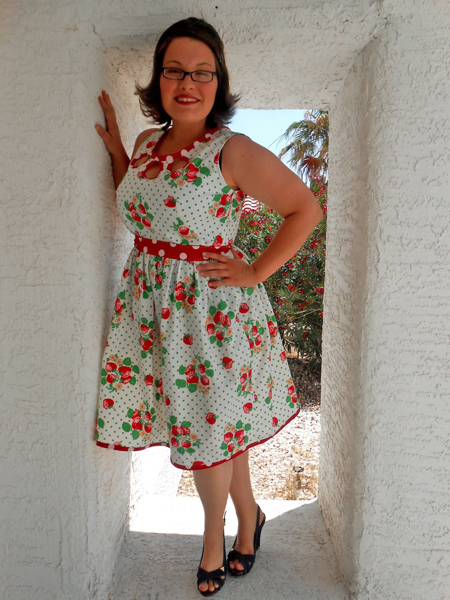 Crystal’s fabric choice and modifications give her Angie a cute, retro feel. And how fun are the cute peek-a-boos at the neckline? She also made an overskirt from the polkadot fabric you see here in the trim. You can read all about it on Ginger Dimples! I also wanted to give a shout-out to Kelley from Casa Crafty and Renee from Two Many. The judges whittled down all of your amazing entries down to four final projects, which included the two winners above and these two Honorable Mention projects. Kelley’s dress is from a Japanese pattern. “This dress is different from the many entries and fits her great,” said one of our Bernina judges, “I am impressed how fearlessly she approached a Japanese pattern (including the language) plus she added her personal twist to it.” Read about the dress on Casa Crafty. Renee made a pretty chevron skirt. Our judges loved the easy wearablity and sweet pocket details. Read about the skirt on Two Many. I have compiled all of the SONP 2013 Winners and Judges’ Choice Honorable Mentions on Pinterest where you can see the twelve projects that the judges chose as their favorite entries to the Summer of No Pants 2013. Check it out and see if yours made it to that list! 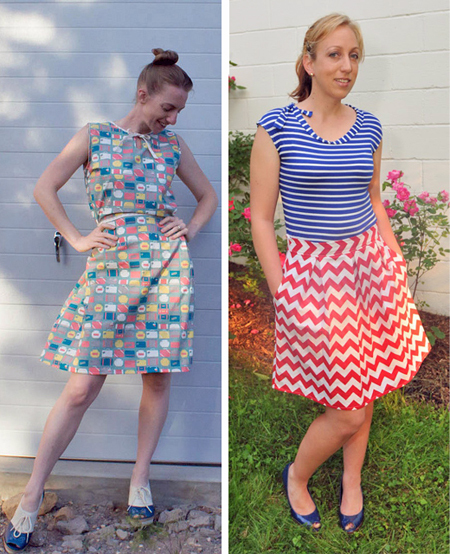 Abby of Sew Much Ado ~ Abby’s sewing tutorials are always on-trend and easy to follow. Her versatile Seaferer Top pattern just made it’s way around some of the most popular sewing blogs on the Internet. I’ll be picking it up myself so that I can have a few go-to tops to wear with all of my new skirts this summer! Marissa of rae gun ramblings ~ Marissa’s blog is a fun mix of crafts, recipes, sewing projects and book geekery. She has a great sense of humor and it shows up in her work. She also has the sweetest Etsy shop that is full of ruffled baby bottoms! Jen of iCandy ~ Jen’s patterns and tutorials for women always find the perfect balance of style and comfort. Her Everyday Skirt is aptly named because it pops up on my Pinterest feed just about every day! We also had Alice, Amy, and Gayle from Bernina + WeAllSew weigh in! They have been wonderful supporters of SONP this year and are the generous sponsors of the Judges’ Choice prize of a Bernina bernette 46 sewing machine, as well as a prize pack of goodies for our People’s Choice Winner. And, finally, me! I’m Marigold! I host The Summer of No Pants on my craft blog, Hideous! Dreadful! Stinky! You can also find me on Disney’s Spoonful.com every week sharing easy craft tutorials for kids and their parents. Thanks so much to everyone who participated and followed along, the judges, and the sponsors! Remember, the Google+ SONP Community will remain open, so keep on sharing the skirts and dresses you’re making this summer. And be sure to follow the SONP Inspiration Pinterest Board, where I’ll keep posting about skirts dresses all summer! I love seeing you without your pants! Previous Previous post: WeAllSew Celebrates Our Loyal Fans!